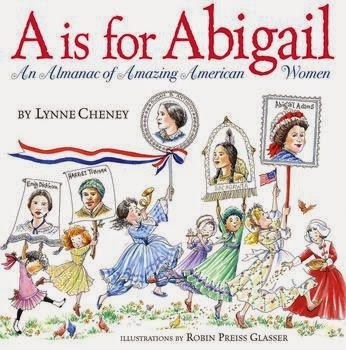 A is for Abigail: An Almanac of Amazing American Women is a fantastic picture book that tells of the many historical achievements made by women in America. It is a great book to read to young girls and boys alike. The book begins with the author’s introduction that tells how women were not able to vote, own property or have jobs at one time – a fact that is not always taught or emphasized in elementary education, but one that girls should know. Readers are then introduced to Abigail Adams, the wife of second U.S. President, John Adams, and mother to the sixth president, John Quincy Adams. It goes on to tell of over 100 women who made an impact on American history, including Harriet Tubman, Rosie the Riveter, Susan B. Anthony, and Sacagawea. The book does not go into great detail about any one particular woman, instead it describes in brief sentences or one paragraph the achievements of great women in different occupational fields or groups. For example, when you get to the part of the book for the letter “E”, it describes several educators in American history including Mary Lyon who found Mount Holyoke College, Anne Sullivan, who taught deaf and blind student Helen Keller sign language and to speak, and Mary McLeod Bethune, who found Bethune-Cooke College, a school for African-American girls. The book also tells of prominent women in math and science in the “Y is for Roslyn Yalow” section. It tells not only of Yalow, but also of the achievements of other women in science like Barbara McClintock, and other women who won the Nobel Prize in science or mathematical fields. For young girls who have dreams of doing something that many women may not be well known for doing, this book is great for giving them the confidence and self-esteem to go for their dreams. There are so many admirable and amazing women in this book, it would be hard for a young girl not to dream big after reading it. And because it describes women who came from all walks of life, it can be appreciated by young girls and women of all walks of life today. For more books about awesome women in history, visit our women’s history page. Image | This entry was posted in Historical, Uncategorized, Women in History and tagged Abigail Adams, Harriet Tubman, historic women, International Women's Day, Rosie the Riveter, Sacagawea, Susan B Anthony, us history, women in politics, women's history, Women's History Month. Bookmark the permalink.